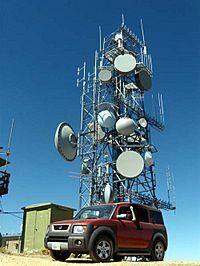 A telecommunications tower with a variety of dish antennas for microwave relay links on Frazier Peak, Ventura County, California. A microwave is a kind of high-frequency radio wave. It is often used to heat food in a microwave oven. When something moves, it almost always has a wave pattern to its movement - this can be seen in water most easily, with ripples and ocean waves. A very common type of wave in the universe is electromagnetic waves. Light is an example of an electromagnetic wave, and so is a microwave. We can only see electromagnetic radiation in the visible light spectrum (which is why it's called the visible light spectrum), so microwaves are invisible. Radio telescopes and radar mostly use microwaves. Microwave ovens work because microwaves make polar molecules (that is, molecules that act like tiny magnets) all face the same direction - to visualize it, imagine that the microwave oven is telling all of the molecules to face left. Then, the microwave oven reverses the waves, so that all of the molecules have to face the other direction - right, in this case. Heat is just the movement of molecules, so when the microwave oven tells the molecules to turn left, then right, then left, over and over again, this makes them get hotter. Water is the most common polar molecule in food, which is why dry foods don't tend to heat as well, or at all, in microwaves. 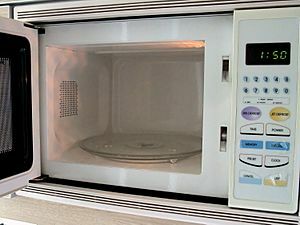 Microwaves get absorbed by these polar molecules, but are ignored by non-polar molecules, and this is why microwaves can penetrate deep into certain kinds of food faster than regular heat. This is also why microwaves don't heat many plastics - those plastics that are non-polar get ignored, so the microwaves go straight through to the food. Metals tend to spark in microwaves, rather than heating. The reason why is that metals like to give away electrons, so when the microwaves "push" at their magnet-like electrons, instead of turning, they just give the electrons away. A bunch of electrons running off on metal is called electricity, and we see it in the form of sparks. Waveguides, metal pipes that carry microwaves, in an air traffic control radar. Microwave Facts for Kids. Kiddle Encyclopedia.